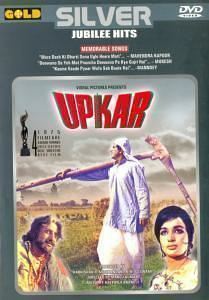 Widowed Radha lives in rural India 1960s, along with two sons, Bharat (Manoj Kumar) and Puran (Prem Chopra). While she would like to educate her sons, and ensure that they lead good lives she cannot do so on her own, and must sacrifice the career of one son so that the second can achieve this goal. For this purpose, Bharat willingly sacrifices his life, toils hard so that Puran can get a decent education, which he does, excels in this studies,and also goes abroad. The family is very pleased, when Puran returns, hoping that he will ensure that they all live happily in India. But the man they know as Puran has been replaced by a cruel, self - serving man who now calls himself Kumar, and whose one goal is to usurp and divide the family property, so that he can continue to live a comfortable life. Buy Upkar (1967)(Family DvD with english subtitles, sold & shipped by JSM MUSIC where you can shop online for Hindi Movie DVDs & Bollywood Music Audio CD & MP3, Discounted Indian DVD. This Hindi Movies collection has been tagged as Family Drama, Patriotic, Action Film, Hindi Movie Dvd.